War, terrorism, repression and poverty are all common features in much of today’s Middle East and North Africa (MENA). How are the region’s demographics changing in the next few decades? And what is the prognosis for improved living conditions? It is difficult to look at the UN 2015 report and believe that the future will play out as outlined by the numbers. 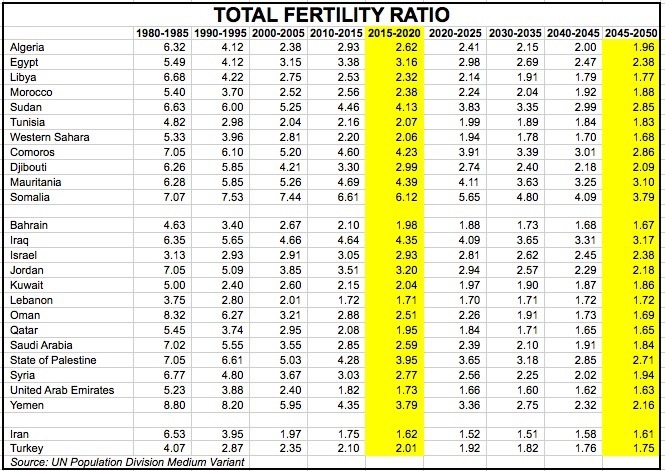 Even under the UN’s ‘medium variant’, which assumes a steady decline in total fertility ratios (TFR = average children per woman), the projected population growth would add significant stress on nations that are ill prepared to feed, educate and provide the needed jobs of the future. Note in the first table that TFRs have been falling for decades and are expected to continue trending towards the 2.1 replacement level, or indeed lower in many cases. Except for Egypt, the North African countries are already near replacement and will dip lower by 2050. And all the Western Asia countries, with the notable exception of Iraq, will be near or below replacement by 2050. Yet between now and 2050, the MENA population will still grow significantly. Every country will have more people by 2050 than today. Lebanon stands out as the sole exception but this is explained by the fact that its population recently bulged by 20% or more due to the influx of Syrian refugees. In due time, a number of these refugees will return to Syria or emigrate to a third country. In thirty five short years, Egypt is seen adding 60 million people to its current 91 million. The people of Iraq, Yemen and Sudan would double and those of Somalia nearly triple. The relatively richer Iran and Turkey (technically not in the MENA region but added here for comparison) will grow more modestly, as will oil-rich Kuwait, Saudi Arabia, the UAE and Qatar. In all, there will be nearly 300 million more people in the MENA, a worrying prospect given the current condition of the region’s economies. Under the right conditions, a growing population could be an encouraging sign and a potent contributor to economic growth. 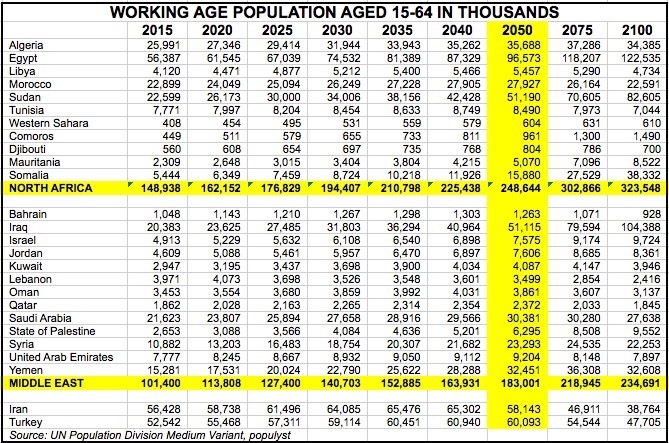 But these conditions include a falling dependency ratio (the number of children + elderly, divided by the number workers). In this case, as shown in the table, the dependency ratio is expected to rise in half the MENA countries. An encouraging sign is the fact that it will be falling in the countries with the fastest growing populations, though perhaps not sufficiently to create the opportunity for a strong demographic dividend. In Egypt for example, the DR would fall from 62.3 to 56.5, not a large decline. And in Iraq, it would go from 78.7 to a still high 63.7. Yemen and Syria stand out for faster declines in their DRs but these figures may be less reliable given the current turmoil they suffer. The MENA region therefore faces a long-term challenge to absorb the large rise in its working-age populations. 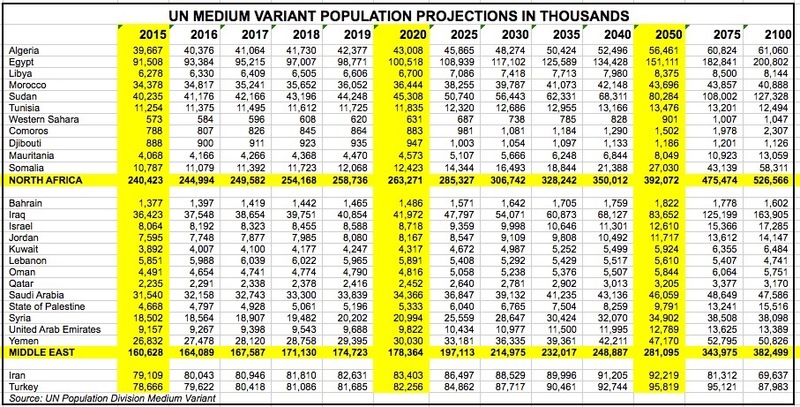 As shown in this table, there will be, within 35 years, 40 million more Egyptians and 30 million more Iraqis seeking employment and improved living standards. In the entire MENA, there would be 180 million more people of working age. Optimism dictates that from the current travails will emerge a model that meets the needs of these rising populations. 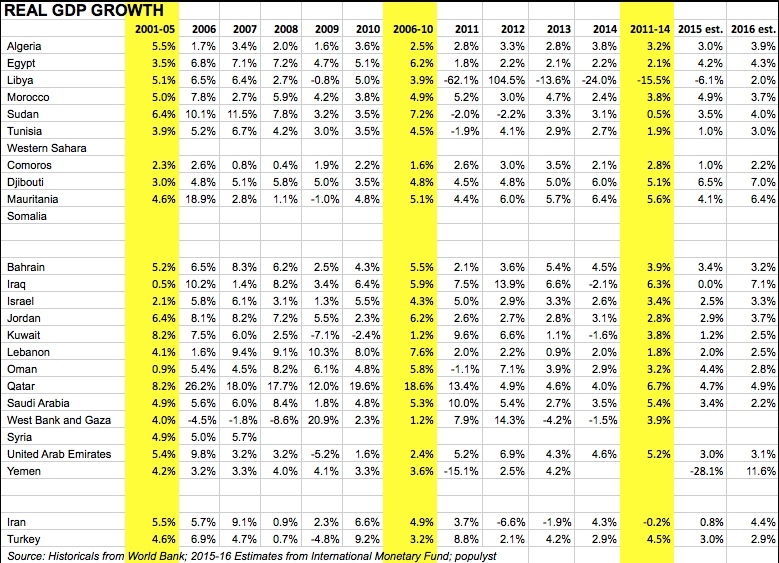 Compared to the years 2001-05 and 2006-10, the most recent five year period has seen a marked slowdown in Egypt, Jordan, Oman, Lebanon and Qatar, and continued strong growth in Saudi Arabia, the UAE and Iraq (to the extent that these figures can be trusted). The IMF’s estimates for 2015 and 2016, shown in the table, may prove too optimistic if energy prices remain low. Per capita GDP shows a clear divide between on one side the oil rich countries Saudi Arabia, Qatar, Kuwait and the UAE, and on the other side poor or mismanaged countries. In theory, Iraq’s and Libya’s oil wealth should position them to join the club of the wealthy. But with the price of oil down from over $100 per barrel in 2014 to about $30 today, there will be contraction in the GDP figures of the richer countries with repercussions across the entire MENA region.